Every year, we release our annual Roll-Out Issue, an easy-to-read compendium of the latest car models that will likely enter the Philippine market in the next 12 months. 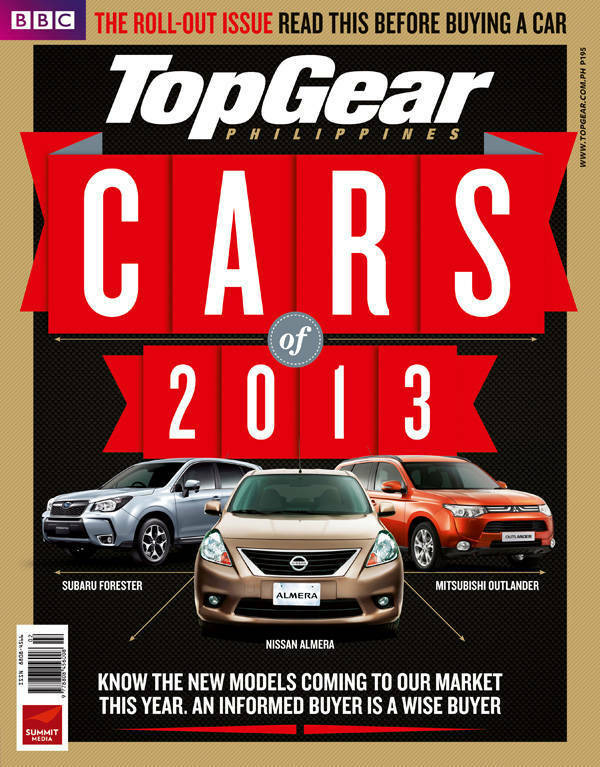 The time to release the 2013 edition of this useful car-shopping guide has come, and you can now get it starting this weekend, still at P195 per copy. The new Roll-Out Issue features a total of 71 new cars, including the three you see on the cover: the Nissan Almera, the Subaru Forester and the Mitsubishi Outlander. "Last year, the Toyota 86 was only a fantasy on paper in the 2012 Roll-Out Issue," says project editor Dinzo Tabamo in his editor's note. "As I was editing the story, I thought it would be a wish come true to be able to drive one, even just around a parking lot. It turns out the universe can surprise you if you want something bad enough." There are dozens more, of course. So, if your car is up for replacement, don't even think about going straight to the showroom without first checking out our list of 2013 models. Nothing could be worse than seeing a new vehicle you absolutely adore right after you've halfheartedly settled for another one.